Make a lasting impression any time of year with an impressive wooden chest brimming with gourmet goodies. 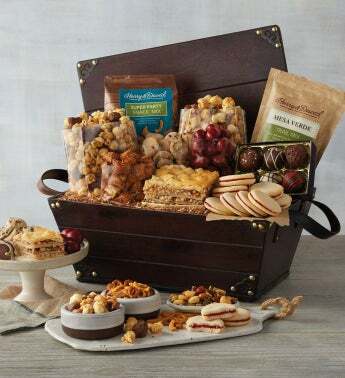 Tucked inside are classic Harry & David favorites like Moose Munch® Premium Popcorn, peanut butter pretzels, raspberry galettes, chocolate truffles, and much more. The sturdy chest features handles and decorative brackets, making it perfect for reuse after all the goodies are gone.